If you have never seen the crema that comes off of a bottomless portafilter, allow us to express just how perfect it is, both in taste and in aesthetics. La Marzocco has created this Bottomless Portafilter for its wonderfully designed GS/3 machines. 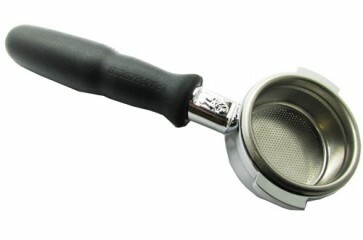 This well crafted portafilter does not include a basket. Fill it up just like you would a standard portafilter. Lightly fill the portafilter basket to the top. Use your finger to gently even out the grounds. Lightly press the tamper into the grounds and find a good center point. Evenly apply approximately 30 pounds of pressure to the grounds. Tap the side of the portafilter to reveal loose grounds. Sit back and enjoy one of the coolest-looking effects in espresso extraction.